On the Good, the Bad and the Ugly of Everything Food and Service. In Canada we celebrate Mother's Day every second Sunday in May. It's a day to show our appreciation for the sacrifices our mothers have made. They are truly entitled to the annual recognition for their contribution to our families. Not to mention our very existence! You've been her life long project and she's corrected you along the way. Her patience wore thin but her persistence never wavered. She taught you how to present yourself and be mindful of your manner. There's no better platform to represent your mother than a dinner date with a lady. In recognition of these most important ladies, I'm inspired to write a relative post about the influence they've had on our etiquette. It's strange days on the dating scene compared to the traditional courtships of old. A busy schedule can drive anyone of us to seek more convenient ways to be social. In a time where inter net dating is the rage, one thing has never changed. The best way to get to know someone is at a dinner table. She'll learn everything your mother taught you on one dinner date. When choosing a restaurant it's important to do your homework before entertaining your guest. What type of cuisine does she normally enjoy? What is her favorite restaurant? Allergies, intolerance's and gluten free can make things tricky when choosing the right spot. An upper casual atmosphere is perfect and somewhere you don't frequent. Without a doubt she'd be uncomfortable if the server, bartender and restaurant owner all knew you y name. 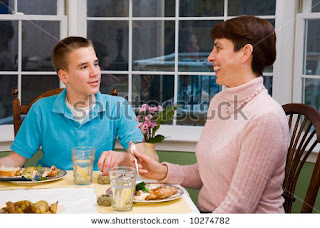 If you have to host your new found friend in a place where you'd feel most comfortable, maybe you shouldn't stray too far from your mother in the first place! Pick something that is relatively new or somewhere you've never been. She wants an experience that is unique. One that she'll gladly tell when asked. The "how we met" and the "our first date" story will be told for as long as you know each other. Do some research for some flattering reviews or reserve on a friend's recommendation. Be willing to make the occasion unique and something new for both of you. You might already know a little of your guest but hardly enough to be at ease. Dashing into a restaurant to be seated right away could be uncomfortable to say the least. Never should a woman be asked to meet you at a restaurant nor should she ever have to enter one alone You've picked the restaurant so don't stop there. Know the area and suggest a cafe you can meet for the first time. It's a great way to break the ice and get an early vibe. A coffee and some early presence is the perfect place to start. Don't hesitate to talk up your excitement for a restaurant you'll both try. Walk to the restaurant together from there and she'll appreciate your considerate plan. You and I both know you are capable of copious amounts of your favorite beer or liqueur. She has a hunch you're capable too. You've picked a great spot so protect the comfort level. The time it takes to enjoy one cocktail it is all the time needed to ignite an appetite. She'll appreciate that you can cocktail responsibly and be confident in her presence. Enjoy the ambiance and discuss the wine list.The two of you will have to make some menu selections to properly determine the variety. Learn her preference for red or white and go from there. A gentleman always accepts a wine and is always the first to taste. If the wine is corked or tainted in any way the lady is spared the unsavory experience. Knowing your servers name is an absolutely crucial! Make a point to never forget. A restaurant is the perfect place to strut your social skills She'll be watching, listening and learning at your every interaction. Your lady friend will quickly learn that you are conscious of others and know how to acknowledge them. Recognizing a person as someone will always build report but don't get too friendly with your server or encourage personal talk. You are already in good company and she deserves your full attention. Appreciate your server's expertise and ask for recommendations. What are the daily features? What is their favorite dish? What is most popular? Make no mistake, your date is not your mother! She's not going to correct your interpersonal ineptitude. Although premature to think it, she has already envisioned her mother's impression of you if it were her her you were meeting for the first time. You'll both be deep into the menus if your server hasn't enticed you with confident recommendations. She may be coy or simply polite but don't let her off the hook. Help her choose something substantial. It's acceptable to take away what isn't finished. Read her the menu and romance the ingredients of something that isn't common place. If you're the clever sort, you'll trust your server's recommendations or opt for a daily feature. Keep her choices in mind so that a single wine selection can be made. If you are unfamiliar with the wine list, ask for a bottle recommendation that will compliment both of your choices. Like any woman she's going to want to know that you can communicate. That means listening and remembering. It's easy to slide into negative conversation on a first date if the conversation is only of past experiences. Be careful where it leads and talk about positive things. Goals, dreams and action plans are the only things two hopefuls ever need to expand. At the very most throw a pet peeve out there. Something that can be laughed at. Like your mother, she only wants to say things once.You have all night to refer back to specific things that will show her she's been dually noted. Eye contact and listen to what she says because there will be a test later. A woman likes to dance when she's the only person in the room. A man likes to eat like he's the only person in the room. Eating is a very individual action that we all enjoy intimately. It's a natural, habitual action and it's easy to lose awareness. Know how you are perceived and let the your company set the pace. You're plate isn't going anywhere and she should still be your focus. You have all night and as long as there is food in front of you the more comfortable the table will be. I'd like to think that no one is ignorant of basic table manners. Self awareness and knowing how you are perceived will only make you more interesting. Your mother didn't raise a slouch that forgets where he is or the brand of company he is in. Every woman in the world has a sweet tooth and an incredible weakness for chocolate. They also have a discipline for passing on a sweat treat. It's not an occasion to count calories together. Take it upon yourself to make the irresponsible decision for both of you. You've had plenty of time to learn some of her favorite indulgences. Show her that you've been taking it all in and have noted her sweet confessions. Order two desserts and let her choose from both. She'll decide if you'll both share. I'm all for how we have evolved as a society and fully support the equality of men and women. With that said, it still doesn't seem proper to expect a woman to pay in full or in part on a first date. Always pay the cheque! You have enjoyed her company and the pleasure was all yours. Maybe next time she'd be happy to treat. All good things have to come to an end. Know when to say goodnight. What a tragedy it would be if the most perfect of times was spoiled for no end in sight. It might not only be you that wants the night to last forever. Be confident and make no error in judgement. See her to her vehicle and at best a friendly hug. Keep things simple with something to look forward too. Much will be left to anticipate. There is much to be learned from our mothers about our very presence. They've taught us how to treat a lady.and in many more ways than one. Our mothers have been working feverishly at our dinner tables at home. As long as there is food on the table our mothers are building men.